G4S, one of the world's leading international security solutions group with approximately 600,000 employees, specialises in outsourced security-related business processes. Back in 2008, G4S Israel was seeking to enter the VSaaS (video surveillance as a service) market and sought out business partners. That is when they were introduced to VideoCells and its VSaaS solution, WebVR®. VideoCells' WebVR, a carrier-grade video surveillance platform, was presented and caught the attention of the G4S team, with its unique capabilities to enable a large number of users to access a central platform, without compromising overall performance and reliability. To achieve G4S' vision of a future in providing hosted video surveillance with a business model based on recurring monthly revenue, VideoCells and G4S entered a partnership. 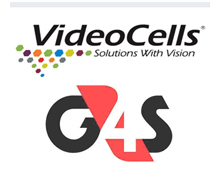 Together, G4S and VideoCells worked on setting up the VSaaS solution, hosted in G4S' highly secure data centre. The two companies conducted a thorough pilot, and focus groups were arranged for qualitative research. Following the pilot and focus group reports, G4S looked for an Internet vendor that could provide the dedicated IP-VPN lines and would also benefit from the WebVR solution. They chose Bezeq, Israel's largest telecommunications provider, who saw the potential in obtaining recurring monthly revenue based on monthly subscriptions from companies of varying size, most of them having multiple branches. Following the success of the IP-VPN based solution, G4S decided to purchase an additional WebVR system to reach the mass market of end users in the residential and small business markets. G4S launched an advertising/PR campaign, offering an array of affordable options, starting with a basic security package that includes an IP camera and 7-days recording, and moving towards more sophisticated packages that include alarm systems, monitoring services, patrol services and more. In less than three months, G4S and Bezeq sold enough cameras to cover their initial investment, after which their WebVR operation remained profitable. "Our partnership with VideoCells has been a win-win situation right from the start. VideoCells' team of experts goes above and beyond the call of duty to work with us and satisfy our requirements. VideoCells is on the leading edge of industry trends when it comes to video surveillance as a service, the same market we are excited to be entering. The WebVR solution has played an essential role in our successful launch; its flexibility and scalability enable us to offer an affordable video surveillance solution to the mass market," said Nehemia Admoni, Vice President & Division Manager, G4S Israel.